I've started training again. Best. Mood. Ever. As I rolled into June I turned 38. I hadn't run a parkrun since December last year, hadn't ridden my bike properly since Lanzarote (where my ITBS came back again in full force and I was so pissed off I couldn't even bring myself to blog about it), and hadn't got in the pool for ages. I'd followed my re-hab exercises relatively well for a few months, and then dropped off most things for a month or two. This is pretty standard behaviour, I suspect there's a "5 stages of rehab" pattern that most people follow. 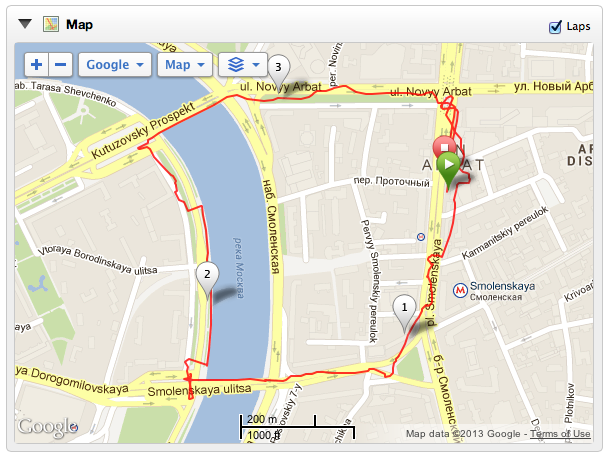 I decided to follow C25k (couch to 5k) plan, but accelerate it a bit. I'm doing the first two runs of every week, skipping the third, and running every other day - it sounds a lot but there's really not much running in the beginning, just a few minutes followed by a few minutes walk - but I don't care, it's running, and I love it. It's strange that running was always my weakest discipline and took the most work to improve - yet it turns out it's the one I have missed the most. Since then I'm now up to repeats of 5 minutes running and 3 minutes walking - still no knee/ITBS pain, and I reckoned good enough to get me round parkrun. I bimbled off to Wimbledon Common yesterday with Mrs, met up with Abradypus, and ticked off my 69th parkrun. 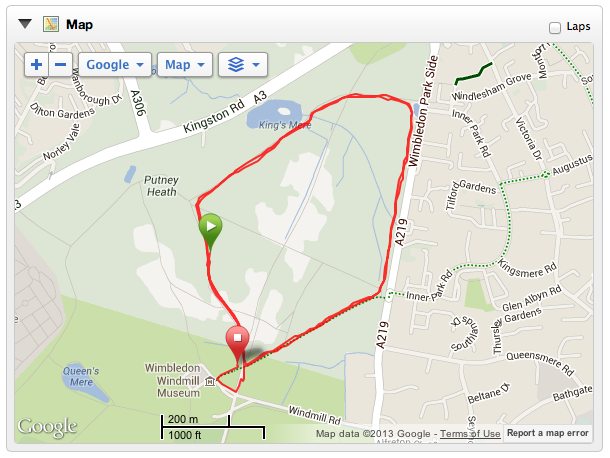 I've never ever been so elated to have run 5km in a leisurely 34:08. 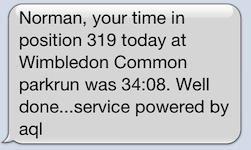 It's been a while since I've received a parkrun results text - 34:08, my "come-back PB"! Absolutely loving it, but I must make sure I build up really slowly - running is really hard again, HR goes through the roof on a medium-paced jog. I've decided when I get to 5km non-stop (a couple more weeks) I'm going to sit there for a couple of weeks before trying to go longer/faster, just to let everything adapt (muscles adapt quickly, ligaments and tendons take longer - don't overdo it, kids). Best. Mood. Ever. I got off my arse and got in the pool while we were away for my birthday too. Shattered after just a few lengths, I think I managed a total of 20 in the 20m pool with frequent breaks. Worth sticking with as I remember just how fast endurance comes on in swimming - and so on Friday I went to Virgin Active Merton Abbey on the way home from work, warmed up a bit, and then smashed out 16x 100m off 2:30, starting at 1:52 or so, drifting down to 1:58, then putting in a massive effort at the end and finishing on 1:53 followed by a monster effort to make 1:46 (the only sub-1:50 in the whole set). OK so I couldn't move my arms (or anything else) afterwards - but what an achievement, my hardest effort swim since, well, probably November 2012! Best. Mood. Ever. 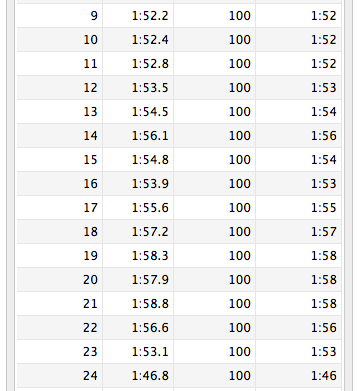 Check that last 100m split! I've had a few cycle-commutes, taking it easy so about 5-10 minutes slower than "normal" each way, but I haven't gone out on my proper bike yet. Today was the day. I popped out for a 55km easy spin to see how it goes. Only one hill (Box Hill) but that holds no fear. Can you spot Box Hill? The short version - no pain, big smile, chewed up the 55km no problem and felt relatively strong when I got back home. Cadence was nice and high throughout, and although I wasn't particularly fast I was consistent on speed and didn't drop off at the end. Next week I'm going to take on our "Three hills" route - covers a lot of the same roads but with a longer route to Box Hill - total of about 90km. Can't wait. Best. Mood. Ever. Not sure "gyming" is a word, but never mind. If I'm going to build up again it has to be supported with a real effort at also building strength and core. A lack of glute strength is what led to my injury in the first place, so I have to take it seriously. Ben and Tarsh recommended The Athletic Edge - so I popped in. Ben and Josh have a small outfit in Hampton Wick. They are focused on functional strength for athletes, and triathletes in particular. I'm going for a coached session every Wednesday, and a self-managed secondary session in the gym at the weekend. Follow @EdgeAthletic on Twitter and check them out on Facebook. It's a long time since I've seen a PT and it felt great to be put through my paces again, even though it was only the first session. Focus is on pre-hab, strength, and triathlon-specific performance - perfect. They've already shared a structured training plan with me in Dropbox, and that's exactly what motivates me - working through a structured plan and seeing the incremental improvements, I'm so pleased to see this approach. They plan season-long cycles with a sub-structure based on when you need to peak for races. Looking forward to getting strong and not getting injured again! Best. Mood. Ever. I have a few events coming up. 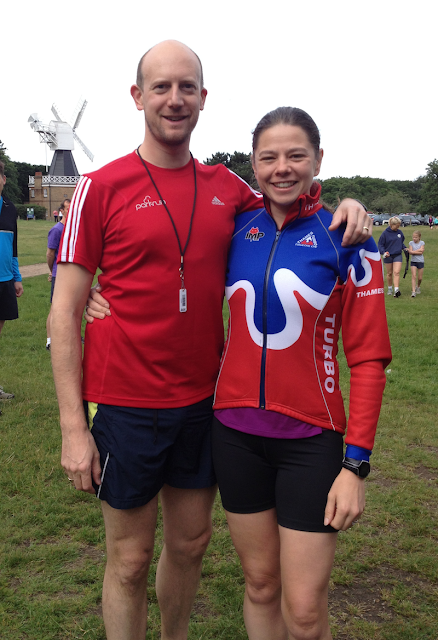 Virgin Active London Triathlon is 4 weeks from today. I'm signed up for the Olympic Plus (1,500m swim, 90km bike, 10km run), basically an Olympic distance but with a double-length bike (it's not my fault, I entered last year when I was on an Ironman high and felt invincible). The task for this one - get through it without hurting too much and enjoy some race experience. No need to smash it hard before I'm ready. After that, Ironman 70.3 Zell am See in Austria in 10 weeks - a fast flat course but again I'm not going for a PB, I just want to end the year in one piece and strong for next year (plan TBC for next year, no rush to make plans). I'd also really like to do the Thames Turbo Marathon this year - but I'm not prepared to do that if I'm not ready by then. It's the first race I missed last year after being injured so I would take great psychological satisfaction in being fit enough to complete it this year (plus, I *still* haven't ever run a stand-alone marathon). Oh, and shhh don't tell anyone, but I entered Ironman 70.3 UK for 2014 - I also made a stupid challenge on twitter that I was going to break 5:30:00 for it - 45 minutes quicker than last year. Oh well, I like a challenge! So all is good. Take it easy, don't go too far too soon, stick to the gym, and all will be well.